I have the solution for the leftover Thanksgiving turkey in your refrigerator! I had the most amazing Thanksgiving this year! It was the first time we made it at my house which meant my mom and I did all the cooking. I really enjoyed making (and eating of course!) the mashed potatoes, gravy, stuffing, and more! The best part was learning how to make the big turkey from my mom. Once we all sat down at the table, surrounded by family, it was such a great feeling to eat all the delicious food we had been making for the past 24 hours! After a turkey-and-too-much-food induced nap, I spent the rest of the day enjoying time with friends and family. But now that Thanksgiving is over, we all have the dilemma of what to do with the leftover turkey. Well, I have the solution for you! I shredded up the leftover turkey with two forks and fried it until it was crispy in a flavorful fried rice recipe. 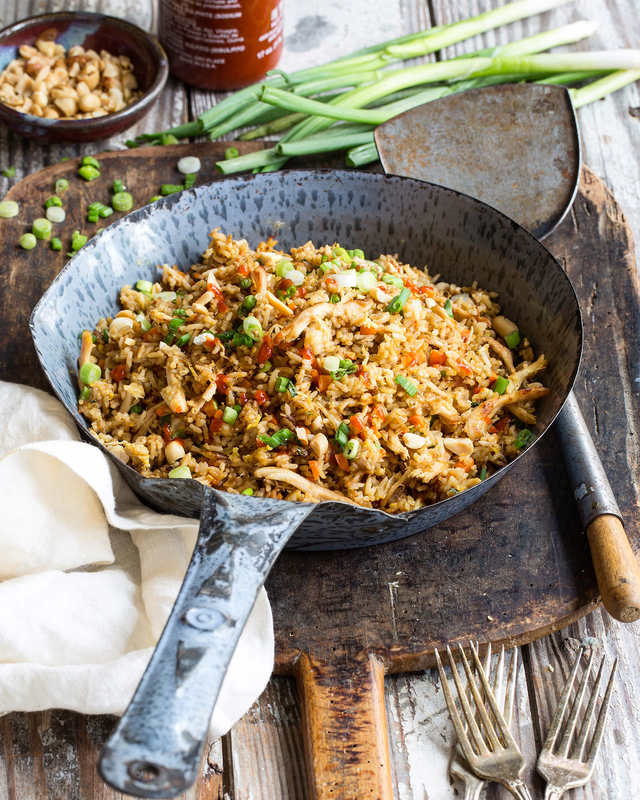 This Turkey Fried Rice recipe is a quick and easy dinner for this week that uses up thing you already have in the fridge. Obviously, you can always make it year round with leftover chicken or you can even make some fresh chicken or turkey just for this recipe because it is that good! I hope you guys had an incredible Thanksgiving too; full of family, food, and gratitude! Lol, that rhymed! In a large skillet or wok, heat up 2 tablespoons of vegetable oil over medium high heat and add the onion, vegetables and turkey. Cook, stirring occasionally, for 5 minutes until onions soften and meat starts to slightly crisp up. Add the rice and an additional 1 tablespoon of vegetable oil and fry, stirring occasionally and breaking up the rice until the rice is crispy and heated through. Stir in the green onions and season with soy sauce to taste. The rice should be extremely hot, steamy and starting to crisp. Turn up the heat if needed. Pour the lightly beaten egg into the rice, stirring quickly to coat each kernel of rice with egg. Fry until egg is crispy and cooked through. Season with pepper to taste and garnish with sliced green onions.